Summer is the best season for outdoor crafts. Especially when kids have a break from school and spend much time at home, you can have some constructive time with them. As warmer days give us the chance to hang out on the balcony or the yard, we have the desire to make the outside space more attractive. There are fun activities to engage your kids during holidays, but you can also use your creativity to relax yourself. I’ve always loved wind chimes and in today’s post you can see a very easy creation with objects we had at home – actually, we used rubbish – which only took little time to make. All we needed was a small piece of branch, a few useless metal objects to hang as ornaments and some cord. 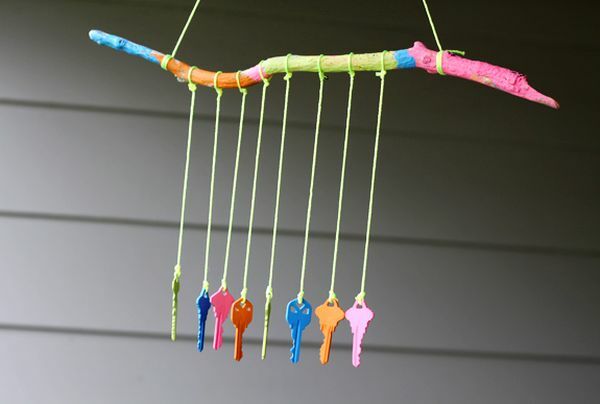 My inspiration was this colorful wind chime with keys that you can see below. But there is another wind chime I would like to try. It is the one you can see below with repurposed silverware. In the past I had made some wind chimes with sea shells and I was also very enthusiastic with indoor ones which I made using handmade ornaments made of clay and decorated our house. You can see some below. Do you like wind chimes too? Oh these are so cute!!! Especially the one with the colorful keys! I´m bookmarking this for a future project! Thanks for sharing my dear friend!